"I am happy that my children will not know the water crisis like I did before." These are the words of Poppy, a mother in Bangladesh, who recently purchased a water pump through Water.org's WaterCredit program. Her words and dreams express the universal desire of parents to provide a better life for their children. Can you imagine asking your child to walk miles under the beating sun to find water and carry it home? Then imagine praying that your family does not get sick from drinking it. These are the nearly incomprehensible questions and trade-offs that parents worldwide face each day that illuminate the dire reality of the global water and sanitation crisis. Clean water and proper sanitation are the most basic building blocks to a healthy life, yet one in three people on the planet cannot access one or both. When it takes hours every day to find and collect water, it is almost impossible to find time for commerce and community. A family becomes trapped in an endless cycle of poverty. On September 25, 2015, 193 world leaders will commit to 17 Global Goals that will finally end extreme poverty, fight inequality and injustice, and address climate change by 2030. This includes ending the global water and sanitation crisis for all people everywhere because, frankly, we cannot meet most of the other goals without solving for this. With an expansive list of 17 goals, we must not lose focus on individuals like Poppy who are the reason that achieving them is so important. Now that we've agreed on what the global community needs to achieve, we must turn our attention to the most pressing and practical question -- how will we pay for it? While we know that investing in making water and sanitation safe and available is one of the most cost-effective investments a country can make, we also know that many of the countries around the world will not be able to allocate the financing to make this a reality by 2030. International aid will play a crucial role, but that isn't and can't be the silver bullet. We at Water.org propose another dimension, one that we think has been overlooked for far too long. What if the world saw people living in poverty not merely as recipients of aid but as catalysts for change? What if the most disadvantaged were actually empowered to be the change makers? It's expensive to be poor. So expensive in fact that people who live below a country's poverty line can end up paying 5-15x per liter of water compared to people who live above that poverty line. 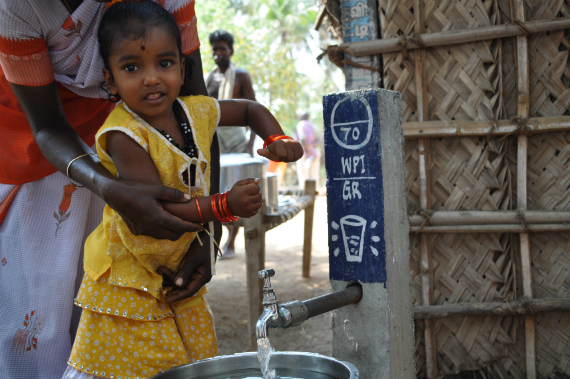 When given a choice and an opportunity to pay for water and sanitation improvements over a reasonable period of time, families opt to finance long-term solutions versus struggle day-to-day to find that next liter of drinking water, use a pay-per-use community toilet, or risk the danger of open defecation. Families themselves are powerful agents of change, with rights and resources to bring to the table. If we are to achieve the ambitious targets of the SDGs, we need to think outside our typical boxes. Through Water.org's WaterCredit program, we partner with small banks or micro-finance institutions (MFIs) and nonprofits to jumpstart small loans for purposes of installing or constructing water connections, rainwater-harvesting tanks, toilets, and full bathrooms. These loans empower people like Poppy to put in place the solutions they choose -- in Poppy's case, a basic water pump. No longer spending hours fetching water, Poppy obtained a job and her daughter no longer misses school in favor of helping her mother secure the family's water. With earnings from her new job, Poppy quickly and easily repaid her loan. And Poppy is not alone. To date, Water.org has invested $12.9 million to jumpstart micro-lending for water and sanitation with more than 40 bank partners. 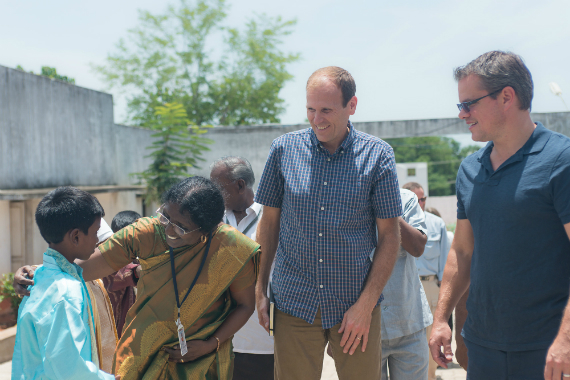 This investment translates to $128 million that has been borrowed and repaid, empowering 2.6 million people across 10 countries to put new and improved water and sanitation in their homes. WaterCredit has a remarkable 99 percent global repayment rate and we're just getting started. We invite you to join us and be part of expanding new and unique solutions like this that will get us to the world we seek by 2030. This post is part of a series produced by The Huffington Post, "What's Working: Sustainable Development Goals," in conjunction with the United Nations' Sustainable Development Goals (SDGs). The proposed set of milestones will be the subject of discussion at the UN General Assembly meeting on Sept. 25-27, 2015 in New York. The goals, which will replace the UN's Millennium Development Goals (2000-2015), cover 17 key areas of development -- including poverty, hunger, health, education, and gender equality, among many others. As part of The Huffington Post's commitment to solutions-oriented journalism, this What's Working SDG blog series will focus on one goal every weekday in September. This post addresses Goal 6.